CHESTNUT HILL, Mass. - Megan Keller, Makenna Newkirk and Cayla Barnes each tallied two points and freshman goaltender Maddy McArthur made 16 saves to lift the No. 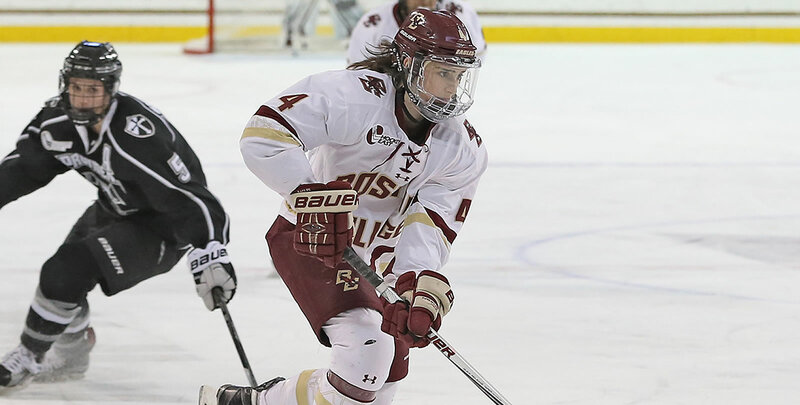 4/4 Boston College women's hockey team to a 4-0 win over UConn on Saturday at Kelley Rink. With the win, the Eagles earned a regular-season series sweep of the Huskies. Keller scored twice, Newkirk had one goal and one assist while Barnes tallied two assists. Seven Eagles total earned a spot on the scoresheet. Despite outshooting the Huskies 12-6 in the first frame, the game seemed destined to head into the first intermission tied - until Caitrin Lonergan put the Eagles up 1-0 with 1:56 remaining. Keller then scored twice in the middle frame to push BC's lead out to 3-0 by the second break. The captain found the back of the net just under four minutes into the stanza and then potted her sixth goal of the season with 5:31 on the clock. Though not tested often in the first two periods, McArthur responded with a pad save at the right post to keep the score line where it was and her two-period save total stood at 11. McArthur made a key right-pad save on a UConn 3-on-1 early in the third period and then Newkirk's goal at the midway point padded the lead for the Eagles. Fisher finished with 30 saves for UConn while McArthur had 16. BC had the 34-16 edge in shots on goal. Neither BC (0-for-4) or UConn (0-for-5) converted on the power play. Saturday, Nov. 17, 2018 | 2 p.m.
1st, 18:04 | 1-0, BC GOAL: Barnes threaded a pass up the left wing to Lonergan who took the puck over the blue line and crossed into the right circle. Lonergan wristed a shot far post, past the blocker of Fisher and in. 2nd, 3:45 | 2-0, BC GOAL: UConn dropped below its own goal line with the puck and Newkirk was able to dig it out, skate behind the net and hit Keller for a one-timer at the bottom of the right circle that beat Fisher's glove. 2nd, 14:29 | 3-0, BC GOAL: From the point, Barnes fed Daryl Watts into the left circle and she skated a few strides before threading a pass through two Huskies to Keller at the right face-off dot. Keller collected the puck and wristed it into the net. 3rd, 9:29 | 4-0, BC GOAL: Bridget McCarthy pinched on the left boards and got the puck below the goal line for Kelly Browne. The freshman picked up her head and spotted Newkirk headed for the left hashmarks and the captain one-timed it home inside the right post. - The Eagles lead the all-time series between the teams, 34-15-9 ... at Kelley Rink, BC is 19-6-2 against the Huskies. - Megan Keller moved her point streak to eight games while Caitrin Lonergan bumped hers to seven ... Makenna Newkirk's point streak now stands at four games. - Maddy McArthur's fourth shutout of the season ties for the national lead and is two more than any other freshman netminder ... three of her clean sheets have come against UConn. - This was Keller's first multiple-goal game of the season and fourth multiple-point outing ... she also had four blocked shots in the game. - Barnes registered multiple assists (2) for the second time in her career and this season. - Newkirk moved into a tie with Kenzie Kent for fourth overall in program history in career assists with 98. - Lonergan's game-winning goal was the 13th of her career and moved her into a tie for fifth place with three other players. - McCarthy's assist was her second in the last three games. The Eagles will return to the ice on Tuesday, Nov, 20 for the first meeting of the year with rival Boston University. Puck drop is set for 7 p.m. at Kelley Rink.